A solid foundation in fundamental theoretical and experimental scientific principles. An excellent opportunity for students to use Rensselaer’s world-class supercomputing center, which operates an 80,000 CPU Blue Gene Q supercomputer and a Watson machine. While the usual program of a graduate student is a highly specialized one compared to most undergraduate programs, substantial opportunities exist, both in principle and in practice, for students to undertake programs of study and research which span one or more fields. Rensselaer Polytechnic Institute's physics program has also been ranked 2 out of 23 in the state of New York. This means the physics program at RPI is in the top 5 in New York. 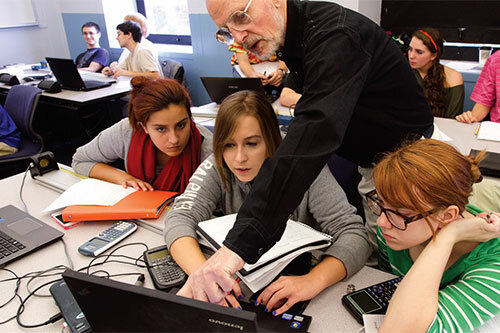 See the full ranking of physics programs in New York. Rensselaer Polytechnic Institute Board of Trustees member Jeffrey L. Kodosky, a member of the Rensselaer Class of 1970, has been named to the National Inventors Hall of Fame (NIHF). The announcement was made Jan. 8 at the CES 2019 annual conference in Las Vegas. Experimental results from the XENON1T dark matter detector limit the effective size of dark matter particles to 4.1X10-47 square centimeters—one-trillionth of one-trillionth of a centimeter squared—the most stringent limit yet determined for dark matter as established by the world’s most sensitive detector.